In 2014 Indonesia passed laws that promise to radically change its energy mix. In a little over eight years, 23 per cent of the nation’s electricity must be sourced from renewable sources. The South East Asian powerhouse has also signed up to the Paris Agreement, pledging to reduce its emissions by 29 per cent by 2030. It will not be easy. Indonesia’s energy demand is set to grow significantly over the next decade, driven by solid economic growth and a rising middle class. From now to 2020, energy demand is set to grow by 30 percent, to 2025 it will almost double. In Java alone it is set to triple. That means a lot of new generation needs to come on board, and to meet the country’s renewable energy and climate goals, that new generation needs to be as clean as possible. Currently, less than 20 per cent Indonesia’s energy comes from hydro, geothermal and other renewable sources. Adding another degree of difficulty is a shortage of skills. It has been reported that Indonesia is short of 30,000 engineers annually. On Friday 11 November I had the opportunity to participate in a panel discussion organised as part of the Australia Indonesia Business Week, in Perth. I believe there are many ways in which Australia, and Australian businesses can help Indonesia implement increasing levels of renewable energy to achieve its emissions targets. I focused in particular on off-grid and microgrid solutions, areas where Australia is leading the world. Here’s my view on these opportunities. There has been a long-standing ‘great debate’ in the history of addressing energy poverty over whether scarce funding should be invested in small-scale renewable energy off-grid installations, or whether governments and donors should focus on expanding main grid infrastructure out to rural and remote communities. Small-scale off-grid energy can be rolled out in these communities in a matter of weeks or months, depending on the size and complexity of the off-grid energy needed, whereas communities can wait many years for centralised grid infrastructure to be expanded to their area. An off-grid solution means certainty that energy is being delivered to poor households to enable greater household level economic productivity and education outcomes. Contrastingly, in many grids where there is inadequate supply to meet demand, poor households often find their electricity cut off before industrial and commercial facilities. Off-grid solutions can also provide greater resilience than local, but weak, energy supply, as local communities are less likely to be impacted by blackouts and brownouts that can occur in weak or remote parts of the grid. Past approaches to off-grid energy access have focused on relatively simple, small-scale solutions, such as solar lights. These solutions have been very important in improving quality of life and economic outcomes in regional areas of developing countries. They have enabled step changes in levels of energy access, but they fall short of providing the same level of electricity access as a grid connection. There is a commonly-repeated pattern in which community energy demand growth rapidly outstrips installation of limited off-grid electricity supply capacity. Electricity demand in off-grid communities can rapidly progress beyond the immediate needs of lighting, cooking and phone charging to encompass an array of electric appliances. ARENA’s portfolio of off-grid renewable energy projects, across mining operations, and remote and island communities, highlight many of these advantages, while also addressing the challenges. The mining sector accounts for over 80% of total off-grid energy demand in Australia and remote industries currently rely on diesel for about 1.2GW power, that is prone to supply interruptions and price volatility. 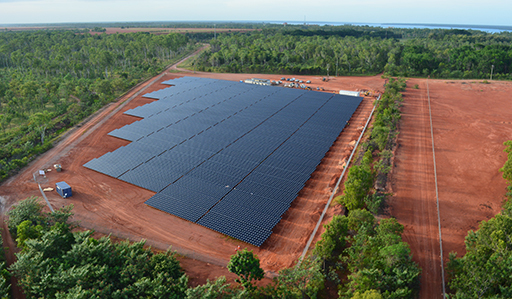 We’ve funded projects in this space, including Rio Tinto/First Solar’s Weipa project on Cape York. From these projects we’ve learnt there are multiple integration technologies, such as storage, demand-side management, cloud forecasting for solar PV, advanced inverters, advanced control system software, and flexible diesel engines, that can support mine site reliability. We’ve also learnt that the commercial structures surrounding integration of renewable energy into diesel or gas minigrids for miners is key to their uptake. So we support innovative commercial approaches and off-take arrangements that allow the miners to capture the value of renewable energy at an operational level but avoids the higher up-front capital costs of renewable energy. The cost of solar PV, battery technologies, and integration solutions continues to drop dramatically, providing real opportunities for off-grid communities. Despite oil prices dropping from over $100 a barrel in 2014 to around $45 a barrel today, the drop in the price of solar modules has been able to keep pace, making renewable energy cost competitive for longer-lifespan community energy projects. Moreover, diesel prices are unpredictable. Cost reductions in solar and minigrid technologies are certain. So we can now go a lot further than simple solar lights or household by household solutions. We can set up entire community scale minigrids with centralised battery banks and control systems that can provide electricity services that are comparable to a grid connection for local residents. We are demonstrating this through a portfolio project in the Northern Territory with Power and Water Corporation (PWC) who own and operate more than 50 micro grids across 1.3 million square kilometres. As part of this project, 9 MW of solar PV is being integrated with existing diesel power stations in more than 30 of those remote locations. Most installations will achieve 15 per cent diesel fuel displacement to start with. These system is designed so that more solar panels and batteries can be plugged in. Meanwhile, PWC’s high-penetration Daly River site will achieve approximately 50 per cent diesel fuel displacement using technologies such as energy storage, flexible diesel technology and cloud forecasting. Daly River will in effect be the sandbox where PWC tests some of the most cutting edge approaches to delivering high penetration renewable energy while providing a high level of energy availability and reliability to residents. That will allow the utility to roll out the most successful approach to its remaining sites over time. Microgrids are another energy solution that are attracting attention around the world, for good reason. In the US for example there is a real push to develop more of these in the wake of Superstorm Sandy, which blacked out a significant portion of the eastern states. Microgrids use much of the same technology as off-grid solutions, but retain a connection to the grid. That gives them two advantages: they can export and import to and from the grid, but they can also be ‘islanded’, or disconnected and still continue to operate. They integrate distributed energy at a local level, and use techniques such as demand-side management to better match local demand with supply. All in all, microgrids allow a lower cost transition from off-grid to grid connected communities. They give the flexibility to roll out off-grid solutions in the short term, and connect up to the grid over the longer-term. ARENA has supported a range of innovative microgrid projects, including the installation of a centralised battery bank and energy management systems through 100 houses at Alkimos Beach, Western Australia. ARENA is also supporting the Lakeland solar farm in northern Queensland, which will test a number of battery operating modes, including islanding the local grid and using local storage and generation to provide broader network support. Many of our project proponents see international markets in developing countries as the best place to take their technologies and approaches and apply them at scale. In particular, Hydro Tasmania is developing a suite of approaches to off-grid energy through its four projects on King Island, Flinders Island, Rottnest Island, and as a technology provider to Energy Development Limited’s project at Coober Pedy. Part of this involves establishing a ‘containerised solution’ in which modular solar, battery and integration solutions can be packed into shipping containers and deployed easily, cheaply, and at scale over many locations. Another company looking to international markets is Sunshift, an innovative company that is developing a re-deployable solar plant that can be set up and integrated on a site, and then packed up and redeployed to other sites after a matter of months. This redeployable solution can be used for off-grid mining and oil and gas operations where the project lifespan is short, it can be used to provide added generation in weak parts of the grid, and it could be used for other instances where short-term power is needed such as for disaster relief. I see all these off-grid and microgrid projects having relevance in the Indonesian context. The country will not reach its ambitious targets with these kinds of solutions alone, but advances in this area hold the promise of making a real contribution to the world’s fourth most-populous nation transitioning to a clean and sustainable economy. ‘It’s gunna get big’: the story of a new solar farm and the people behind its rise.